Hello :) I can't believe it's end of January already and Chinese New Year is finally here! Are you going back to your hometown or travelling somewhere? In this festive season, it's important to protect your loved ones including your beloved gadgets! This year, don’t let cyber criminals gallop away your festive cheer! I'm going to share a few simple steps to ensure your devices and memories are well protected, and connections to your loved ones are not interrupted. Treat your mobile devices as mini computers, make sure they have strong passwords, and ensure they are protected against theft and cybercrime. Though it may seem a hassle to input a password every time you want to access your device, the benefits far outweigh the risks. If your device is ever lost or stolen, a password will prevent thieves from getting into your phone and personal information. It’s best to turn off the Bluetooth and Wi-Fi functions on your mobile devices. Bluetooth and Wi-Fi technologies make it easier for cybercriminals to spy on your activities and transmit data to your device without your permission. Turn them on only when you need them and ensure that the network is secure. If your mobile device connects to the Internet, you’ll need security software to make sure you’re protected against online threats. Download a solution like Norton 360 Multi-Device that will protect up to five devices (including your mobile phone and tablets), regardless of platform or brand. • Multi-Device Protection – The Norton 360 Multi-Device software gives protection to all devices – PCs, Mac, iPhones, iPads, Android smartphones and tablets. • SONAR Behavioural Protection – SONAR detects the signs that a file is dangerous to proactively protect you from never-before-seen threats. It helps with the removal and cleanup of malware attempts by saving the evidence of the attack for later use by Norton’s repair technologies. This remediation helps to ensure that all traces of a malware attack are removed and a system is returned to its original state. • Internet Protection System – This feature actively protects your devices from online threats. The system scours websites and social networking sites for suspicious links and content to identify the latest social networking scams. • Parental Control – This feature helps you protect your kids from online dangers by giving you direct access to Norton Family. Norton Family is a web-based service that helps connect parents to their children’s online lives and start a dialogue about appropriate online habits. • Locate missing phones/tablets – The Scream Alarm feature alerts you to the location of a misplaced mobile device, and the Remote Locate feature pinpoints your lost or stolen device on a map. • Enhanced Norton Identity Safe – Norton Identity Safe remembers, secures and automatically enters your usernames and passwords for you, so they can't be lost or stolen. The latest release offers enhanced password management tool, including improved form filling, with drag-and-drop functionality and full vault searches available directly from the toolbar to help manage passwords even more securely and conveniently. 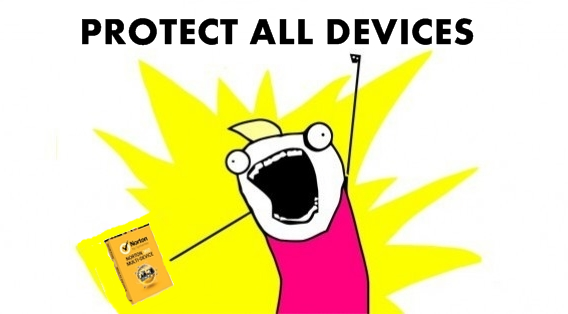 The latest version of Norton 360 Multi-Device, is available for purchase in Malaysia through various retailers and online at http://malaysia.norton.com. 7. Contest starts from today until 14th February 2014.